In the Beginning . George Finch. 14 pgs. Read Before the Ohio Commandery of the Loyal Legion of the United States, October 1, 1884. Peter G. Thomson. Cincinnati. Ohio. 1884. Also in: Sketches of War History, 1861-1865. MOLLUS. Ohio. Vol. 1. Cincinnati. Robert Clarke. 1888. pgs. 218-32. 8 photocopied pages. E464M5.1991v1. USAMHI. Carlisle Barracks. PA.
Ohio Troops at Bull Run . William R. Comus. From: G.A.R. War Papers. Cincinnati. F.C. Jones Post. 1891. pgs. 190-202. 13 photocopied pages. E464G72v1. USAMHI. Carlisle Barracks. PA. The Boys of '61 . George Finch. From: G.A.R. War Papers. Cincinnati. F.C. Jones Post. 1891. pgs. 237-63. 16 photocopied pages. E464G72v1. USAMHI. Carlisle Barracks. PA. The Case of Private Smith: and the Remaining Mysteries of the Andrews Raid . James Smith. 2nd OVI. by Parlee Clyde Grose. 131 pages. Softbound. General Publishing Co. McComb. Ohio. 1963. Concerns mostly the Andrews Raid. Smith was a member of the 2nd OVI. George W. Landrum Letters. 1861-1863 . George W. Landrum. Co. D. 2nd OVI. Transcripts typewritten. 0.2 linear ft. 1 volume. Kentucky native who moved to Cincinnati, Ohio. 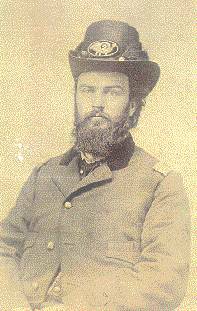 During the Civil War he served first in the 6th Ohio Infantry Regiment (the "Guthrie Gray" Regiment) and later as a 1st Lieutenant in the Signal Corps of the 2nd Ohio Infantry Regiment. He died at Chickamauga in Sept., 1863. Call# MS. 543. Archives Library. Western Reserve Historical Society. This Regiment served in three months service near Washington under Colonel Lewis Wilson, and was organized for three years service September, 1861, under Colonel Leonard A. Harris. It served in General O.M. Mitchell's Division; General Buell's army in Kentucky; with General Rosecrans at Stone River and Chickamauga, and with Sherman, on the Atlanta campaign. The Second lost severely in battle, having 111 killed and 425 wounded during its term of service. 2nd Regiment Infantry (3 Months). Organized at Columbus, Ohio, and mustered in April 18, 1861. Ordered to Washington, D.C., April 19, and duty in the defences of that city till July. Attached to Schenck's Brigade, Tyler's Division, McDowell's Army of Northeast Virginia, June-July. Advance on Manassas, Va., July 16-21. Occupation of Fairfax Court House July 17. Battle of Bull Run July 21. Mustered out July 31, 1861. 2nd Regiment Infantry (3 Years). Organized at Camp Dennison, Ohio, July 17 to September 20, 1861. Left State for Kentucky September 4. Operations in vicinity of Olympian Springs, Ky., till November. Action at West Liberty October 23. Olympian Springs November 4. Ivy Mountain November 8. Piketown November 8-9. Moved to Louisville, Ky., thence to Bacon Creek, Ky., and duty there till February, 1862. Attached to 9th Brigade, Army of the Ohio, October to December, 1861. 9th Brigade, 3rd Division, Army of the Ohio, to September, 1862. 9th Brigade, 3rd Division, 1st Army Corps, Army of the Ohio, to November, 1862. 1st Brigade, 1st Division, Centre 14th Army Corps, Army of the Cumberland, to January 1863. 1st Brigade, 1st Division, 14th Army Corps, to June, 1864. Headquarters 14th Army Corps to August, 1864. SERVICE.--Advance on Bowling Green, Ky., and Nashville, Tenn., February 10-25, 1862. Occupation of Nashville, Tenn., February 25 to March 17. Advance on Murfreesboro, Tenn., March 17-19. Advance on Huntsville, Ala., April 4-11. Pittenger's (Andrews) Raid on Georgia State Railroad April 7-12 (Detachment). Capture of Huntsville, Ala., April 11. Action at West Bridge and occupation of Bridgeport, Ala., April 29. Near Pulaski May 1. Duty along Memphis & Charleston Railroad till August. Actions at Battle Creek June 21 and July 20. March to Louisville, Ky., in pursuit of Bragg August 21-September 26. Pursuit of Bragg to Crab Orchard, Ky.. October 1-15. Battle of Perryville October 8. March to Nashville, Tenn., October 16-November 7 and duty there till December 26. Advance on Murfreesboro December 26-30. Battle of Stone's River December 30-31, 1862, and January 1-3, 1863. Duty at Murfreesboro till June. Middle Tennessee (or Tullahoma) Campaign June 23-July 7. Hoover's Gap June 24-26. Occupation of Middle Tennessee till August 16. Passage of Cumberland Mountains and Tennessee River and Chickamauga (Ga.) Campaign August 16-September 24. Battle of Chickamauga, Ga., September 19-20. Rossville Gap September 21. Siege of Chattanooga, Tenn., September 24- November 23. Chattanooga-Ringgold Campaign November 23-27. Orchard Knob November 23. Lookout Mountain November 24. Mission Ridge November 24-25. Pea Vine Valley November 26. Graysville, Ga., November 26. Ringgold, Ga.. November 27. Reconnoissance of Dalton, Ga., February 22-27, 1864. Tunnel Hill, Buzzard's Roost Gap and Rocky Face Ridge February 23-25. Atlanta (Ga.) Campaign May 1 to August 1, 1864. Demonstration on Rocky Face Ridge May 8-11. Buzzard's Roost Gap May 8-9. Battle of Resaca May 14-15. Advance on Dallas May 18-25. Operations on Pumpkin Vine Creek and battles about Dallas. New Hope Church and Allatoona Hills May 25-June 5. Pickett's Mills May 27. Kingston June 1. Operations about Marietta and against Kenesaw Mountain June 10-July 2. Pine Hill June 11-14. Lost Mountain June 15-17. Assault on Kenesaw June 27. Ruff's Station July 4. Chattahoochie River July 5-17. Buckhead, Nancy's Creek. July 18. Peach Tree Creek July 19-20. Siege of Atlanta July 22-August 1. Ordered to Chattanooga. Tenn., August 1. Mustered out October 10, 1864, expiration of term. Recruits transferred to 18th Ohio Infantry. Regiment lost during service 9 Officers and 96 Enlisted men killed and mortally wounded and 138 Enlisted men by disease. Total 243. More about the Civil War in Ohio.